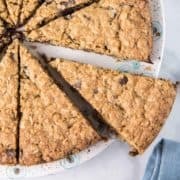 Whether you call it a cookie cake, cookie pizza, or a giant oatmeal chocolate chip cookie, this super easy, crowd-pleasing dessert is a winner! Crispy and firm on the outside and soft and chewy in the center, it’s the best of both cookie worlds. 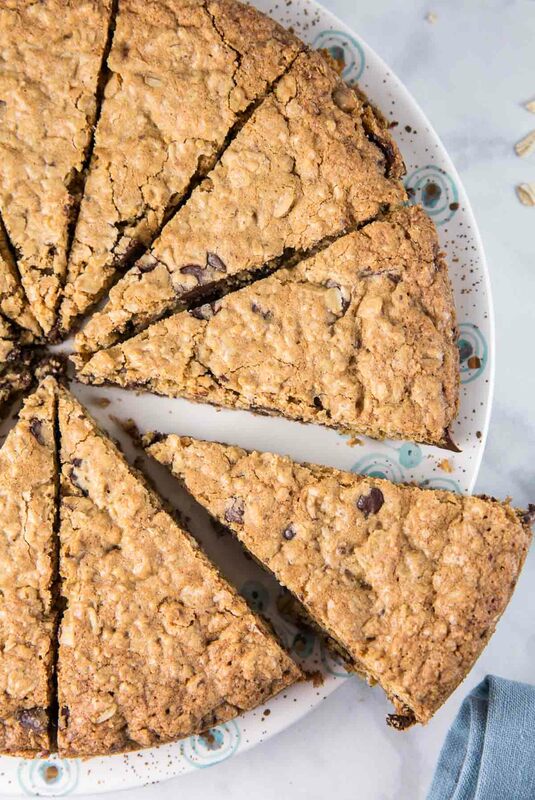 Please note that this recipe is for a giant oatmeal chocolate chip cookie. 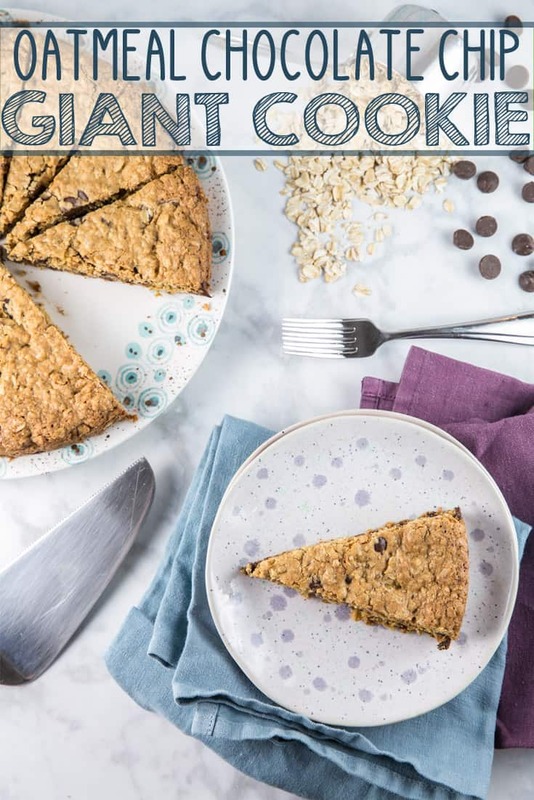 Not giant oatmeal chocolate chip cookies. 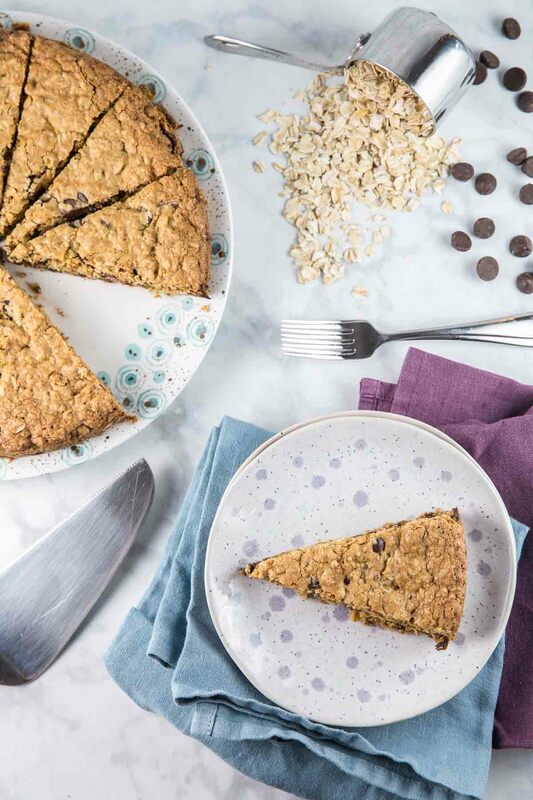 As in, this makes one ginormous oatmeal chocolate chip cookie, perfect to slice and share with a crowd. Kind of like a cookie cake. Except it’s not as thick as a cookie cake, and I didn’t cover it with frosting. So we’re going to go with giant cookie, instead of cookie cake. Tomato, tomahto – whatever you want to call it, it’s delicious. I baked mine in my trusty springform pan, because it makes it so easy to remove the cake and serve. 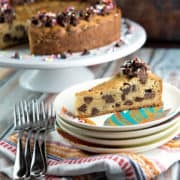 But you can bake it in a round cake tin, or even in a pie plate — using less leavening than a true cookie cake means it doesn’t require a “deep dish” container. One of the reasons I love giant cookies/cookie cakes so much is getting the best of both worlds when it comes to cookie texture. Crispy? Soft? You can have both at the same time! 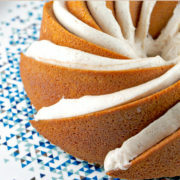 The outside edge starts to get crispy and firm, while the middle of the cake is soft and chewy. Also a bonus? 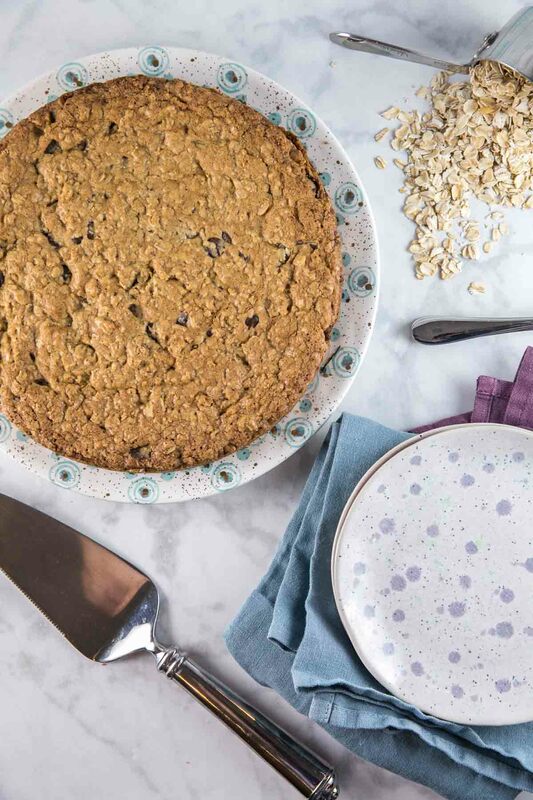 It takes waaaay less time to make a giant cookie than lots of normal sized cookies. And way less time is the name of the game with a newborn. I made this for a Mother’s Day gathering with family friends. Last year, I brought this chocolate chip strawberry trifle, made with homemade pound cake, homemade custard, homemade whipped cream, and sliced fruit. Thinking about doing all that with a crying baby and pumping every 3 hours around the clock? Laughable. 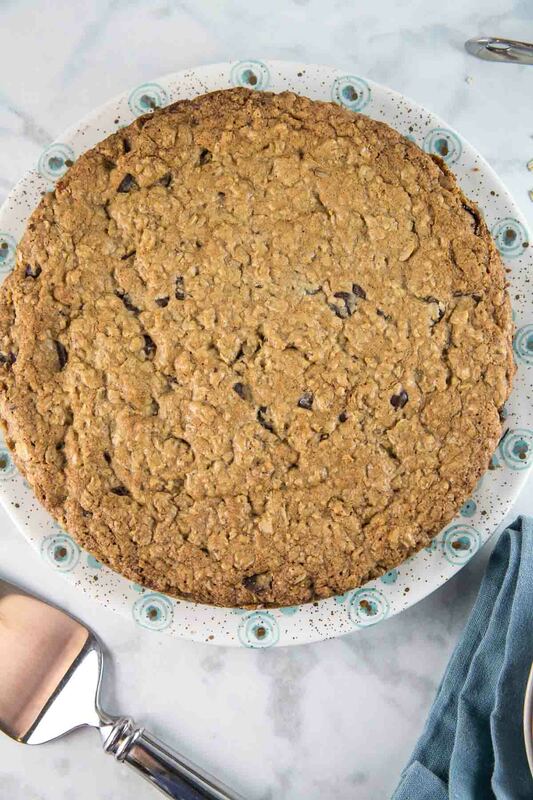 So instead: a giant oatmeal chocolate chip cookie. No need to chill the dough. No scooping and rolling, and waiting for individual trays to bake. Make the dough, press it into the pan, and bake. That’s it. Crispy, soft, and half the time? Win-win! 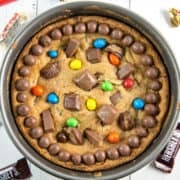 Don’t miss these other cookie cakes! 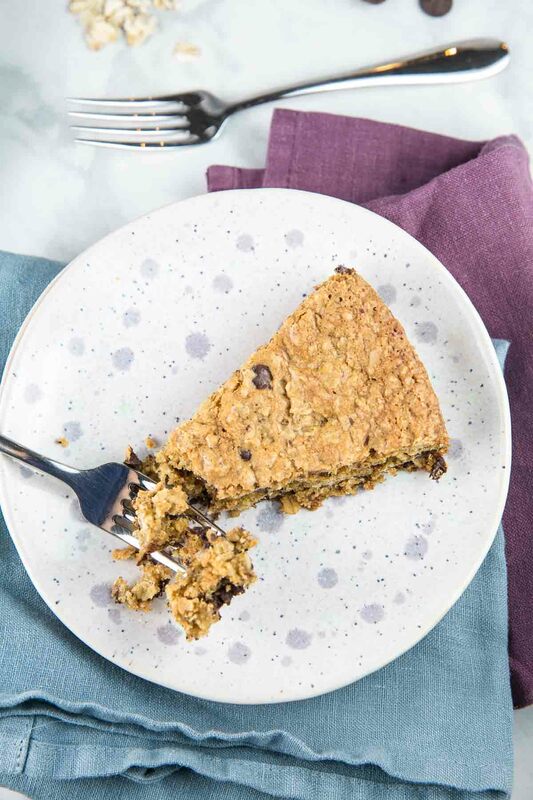 Whether you call it a cookie cake, cookie pizza, or a giant oatmeal chocolate chip cookie, this super easy, crowd-pleasing dessert is a winner! Preheat oven to 350 °F. Spray a 9-inch springform pan, cake pan, or pie pan with nonstick spray. 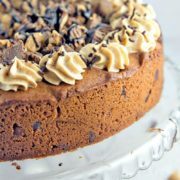 Using a mixer on medium-low speed, beat together butter and sugars until light and fluffy. Add in the egg and vanilla, continuing to beat until well blended. Slowly mix in the flour, baking soda, and salt, just until no streaks of flour remain. Add in the oatmeal and chocolate chips, mixing until evenly distributed. The resulting dough will be quite thick. Scrape the dough into the prepared pan and flatten into an even layer, using fingers or a grease spatula. Bake for 28-30 minutes, until the cookie is just set – firm around the edges, but still soft in the center. 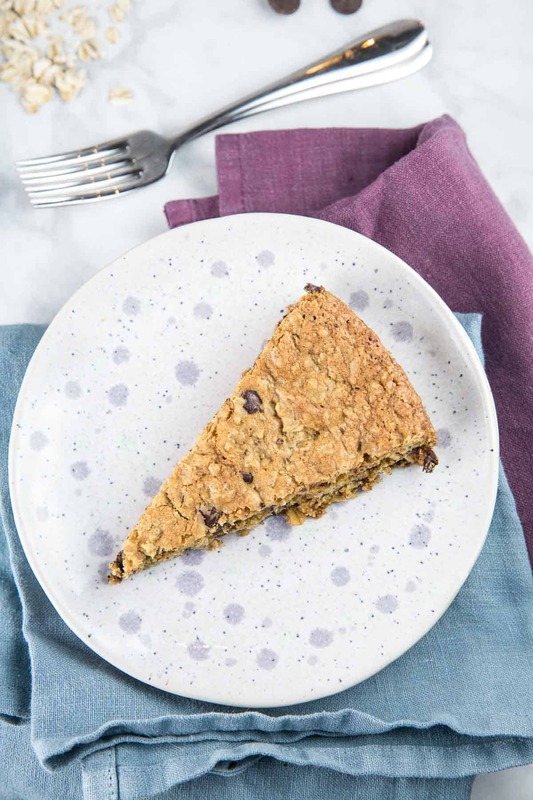 Baked, fully cooled giant oatmeal chocolate chip cookie can be wrapped in two layers of aluminum foil and stored in the freezer for up to 3 months. Thaw at room temperature overnight before slicing. 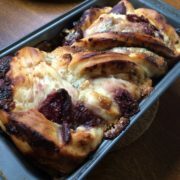 I just made this and it was really, really good! My kids liked the soft middle and I liked the crispy outside. I will definitely make this again.